We all know Instagram is this amazing platform for our brands by now. Everyone's using it, everyone's talking about it, but how can you really get people interested in what you're posting ?? The first way to do this is through your Instagram bio. I know you're probably thinking to yourself "How much can my bio really matter ?? You only get 100 something characters anyways." True, but those 100 something characters can really make or break your brand/business on Instagram believe it or not. 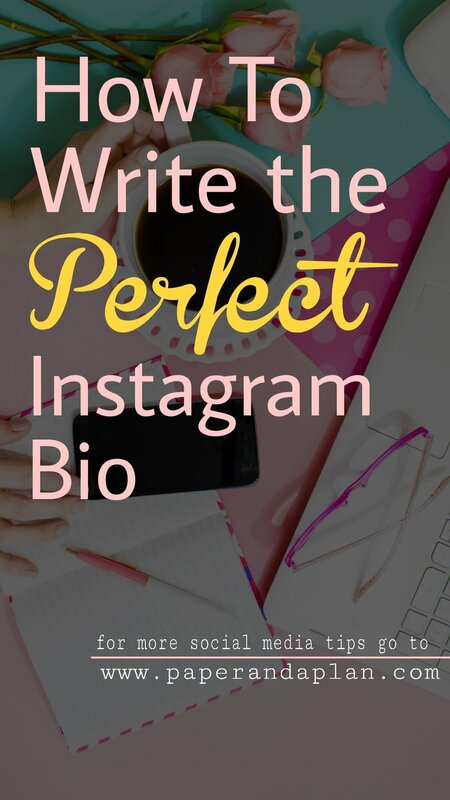 So today we are going to go over a few steps to get your Instagram Bio up to par. Ready?? Let's do this. It's best to delete everything because you want to make sure you have all the available characters and you're not trying to work around what you already have. This was hard for me at first, but I can't even tell you what my first bio said. Something about coffee and an emoji I think. So delete everything you have right now and start with a clean slate. You'll want the first line of your bio who you cater to. MAKE THIS AS CONSISE AS YOU CAN. 6 words ! I'm so serious. My first line says "millennial women content creators" that's 4. You can do it. You want to make sure the first thing your reader or potential follower sees is who you help. This way they can decide if they're on the right profile immediately. You do not want to waste your time on people that don't care about what you do or don't resonate with your page in any way at all. It's better to have 300 content creators than to have 1000 fitness coaches if that's not who your audience is. The very next line after who you help should be what you do. After the reader knows they belong on your page they're gonna want to know how you can help them. This is so important because you would be surprised how many times I go to someone's bio and what they do is nowhere to be found. There's a bunch of random information, maybe a tag line or something, but no clear indication of what the page is about. Sure you could go through their feed, but you want your audience to know QUICK. They say you have about 10 seconds to make an impression with your account. This is about the first 9 pictures of your feed and your bio. Make the first impression a good one and just tell your audience what you do! My second line reads "planning, productivity & social media" Again, condense it ! You only have 100 something characters. This line is really important because you want your audience to know a little about you. They don't want to be following a robot or someone they know nothing about. Make a connection. For this I said "loves: ☕🏖🐱🕉🌸" because I love coffee, beaches, cats, yoga, and flowers. I wouldn't have enough room if I typed this all out In words. So please be sure to utilize emojis for this unless it really can't be put into emoji form. However more often than not it can be. Right below this line is where your website will show up. So what I recommend doing here is putting a call to action for your website. I use linktr.ee so I have many links under one. My line reads " 👇 freebies, fb group, blog & more"
And the little pointing down emoji points to my link. If you have a new blog post always in that spot you can put "👇 read my latest post" or if you are advertising a course down there "👇 FREE webinar training"
If you have enough room like I did, you can add an extra line above the call to action. For this space I used it as an opportunity to tell people about my branded hashtag. This is the tag I use for all my posts and encourage other people to also post under it so I can feature them on my feed or stories. It reads "📸 #productivitybabes "
However you can add any small piece of info here if space allows. See if you can use symbols for things instead of the full word. Instead of "and" I always put "&". Instead of "I take only PayPal payments" or "etsy sales at this time only" you could put "📲💰PayPal only" and "💻etsy seller"
I also tend to use fragments instead of full sentences. Like adjectives basically and leave out the rest. For example "millennial women content creators" instead of "I help teach millennial women content creators". This will help reduce character count so you have more room. Believe me it's tough but you can do it. Here's a screenshot of my finished bio incase you want to see for refference. You can also ditch the punctuation but I had room for mine. As well as the bullet points. Send me a DM on instagram if you want me to take a look at your bio for you. I would be happy to give advice.